Location bedugul Bali is located in the northern region of Bali. Located on the border singaraja and tabanan. Approximately 50 km from the city denpasara. If you are from the area singaraja, it would be easier to get to the area bedugul. From the city of Singaraja to bedugul within 35 km and only taken within half an hour. If the city of Denpasar, you have a little climb up to the top of the mountain to get to bedugul. The road was a bit uphill and winding. But after reaching there you will see the sights of Bali is very beautiful. Bedugul of travel, you can visit Lovina beach which is located not so far. Bali bedugul lake is one of the attractions in Bali which is located in the village temple yellow, kec.Baturiti, Kab.Tabanan, located about 70 km from Ngurah Rai airport and tourist attractions in Kuta. Bali bedugul lake located in a mountainous area which certainly has the air and the atmosphere that is unbelievably cool, coupled with soothing expanse of green trees eye, guaranteed to make you feel at home and want to linger in this place. His position at an altitude of 1250 meters above sea perukaan make the air in this place is always cool and is at a temperature between 17-25 degrees Celsius. Bali bedugul Lake Beratan actually has a name, and the local oranag even more familiar with the name of this lake lake westerlies. Just because it is located in the sites bedugul, be these westerlies lake known as Lake bedugul bali among tourists. Bedugul around the lake there are many tourist attractions, in fact there are two other lakes, but the most famous is the lake bedugul Bali. So, actually, this Bali bedugul lake is one of the tourist attractions in the tourist area bedugul. Other tourist places in the tourist area bedugul include Eka Karya Botanical Garden, Lake Buyan, Lake Tamblingan and Candi Kuning Market. So if you visit Bali bedugul lake, you can also visit and enjoy all the peculiarities of the tourist places. There are many activities you can do when traveling to bedugul bali. The place is also very suitable for you who take a family tour packages. There are many places you can visit. There ulun Danu temple, lake bratan, bali botanical gardens, lake Buyan, Lake Tamblingan, yellow temples fruit market, and culinary betutu. Ulun Danu temple you can see the sights of the temple with a beautiful natural backdrop. This place is often used as a pre wedding photos. In bratan lake you can take pictures and play a lazy river. Bali botanical garden you can see a collection of plants that are very much at all. There are even some rare plants are still cultivated in this place. Bali botanical garden is also very suitable as a place preweeding photo. For other tourist attractions you can also enjoy. Can take pictures, play a lazy river, at the fruit market, you can buy a variety of fruits and many more. Only by visiting bedugul bali, you can do a lot of interesting things. Coupled with a cool atmosphere here makes activities more enjoyable. But when the afternoons are usually lakes around Bedugul Bali Tourism fog. So you do not get to see the sights freely. Bali bedugul lake is a must-see tourist spot if you are in Bali besides Sanur Beach and Garuda Wisnu Kencana. Even before getting to this lake any time you are treated to a view of a very beautiful plateau along the way. Especially when you are up, cool atmosphere, beautiful, and beautiful views of the lake is directly addressed. Besides being able to enjoy the view and atmosphere were incredible, you can also perform various activities in this place, one of the most popular activities around the lake bedugul traditional Balinese boat or a motorboat. In this lake there is a very interesting object of attention, namely Ulun Danu. This temple is a shrine to the god of fertility providers, namely Sang Hyang Dewi Danu. Ulun Danu temple has a very long history, as is evident from the stone board page contains penilitian temple which have been aged 500 years BC, which means that the stone had been there since the megalithic era. 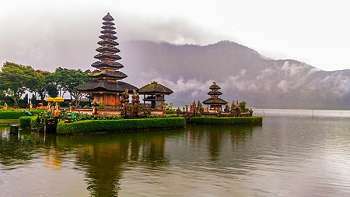 The beauty of the lake district bedugul combined with exotic Balinese temple stone ulun has attracted millions of tourists annually visiting these attractions. The beauty of this area is often perpetuated by those who hunt prawedding photo, as well as those who like photography. Anyway bedugul bali lake and the tourist area around it is very dear if you miss. When are you going to visit here? 0 Response to "Bedugul Lake Nature To place visited When Being in Bali"